This is a tool I made a few years ago when I was unhappy with the other IFF editors on offer. I wasn't going to release it publicly, but due to some friends getting significant use out of it I've put some work into updating and polishing it to be more usable by the wider community. The "IFF editor" nomenclature is historic as the tool now does a lot more besides! If the rest of this post sounds confusing/complex to you - don't worry - it is aimed at two audiences at once. 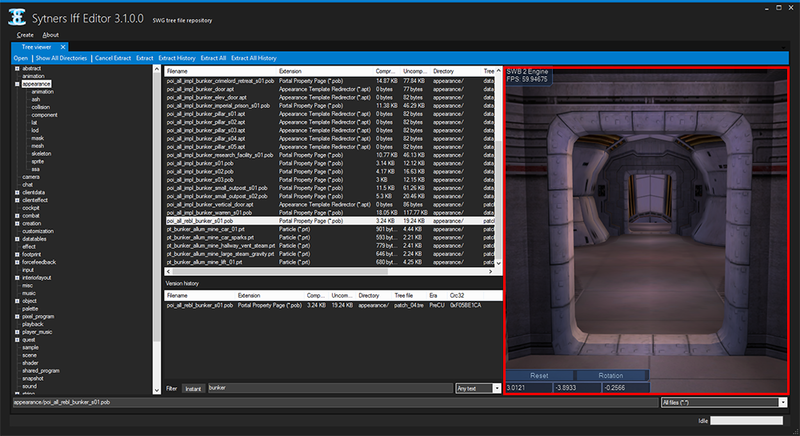 Anyone that has used other tools like Tre Explorer to edit or view SWG files in the past can use this in much the same way. Unlike most tree explorers in the past, the one in SIE works from a repository of .tre/.toc files rather than just one. 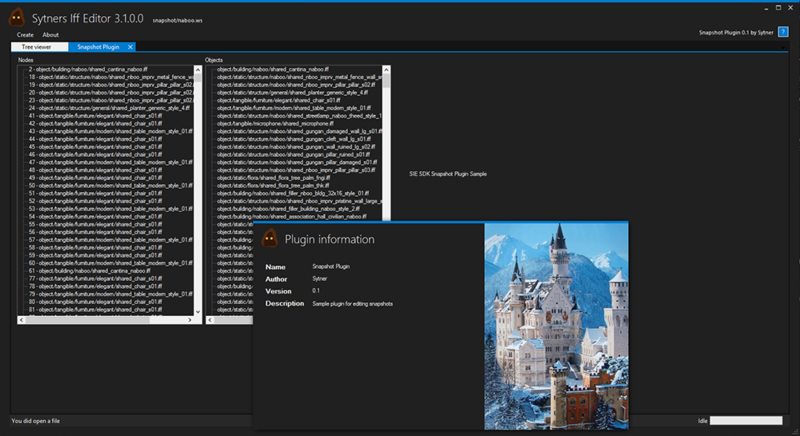 This is configured by default for the PreCU publish 14 client but can be changed in the .cfg to match your needs. The SIE tree viewer can also show/extract/open any version of a file contained in the history composed by the input .tre files. 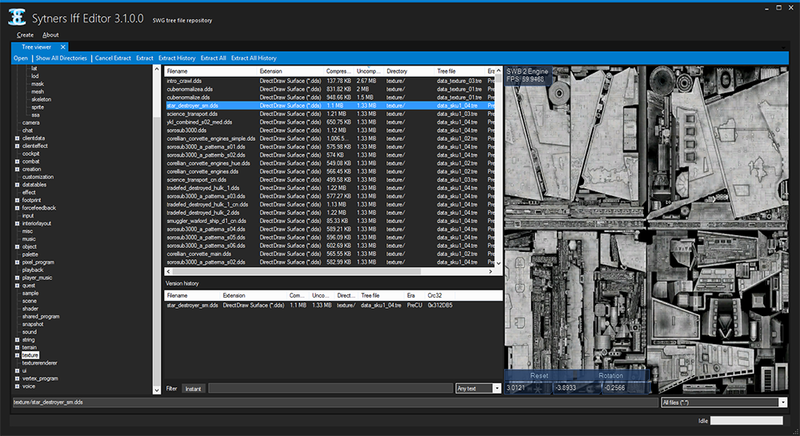 The IFF editor is the oldest part of the tool. It started out in 2009 as a simple replacement for the chunk editor in Tre Explorer, which was frustating me due to showing files incorrectly and corrupting them on save. It remained mostly unchanged until late last year when I decided to turn it into something more useful. The hex-editing functionality (a la Tre Explorer) remains but the highlight feature of this tool now is the template system. The template system provides a syntax with which users can define the binary structures of IFF chunks. These templates can then be applied to chunks in order to edit their values or used to create a new chunk of that type. If named appropriately, templates are applied automatically on chunk selection. As such, keeping to this system for your own templates is highly recommended (the name will be generated automatically for you as a suggestion)! For example, below I have created a template for terrain shader families and used it to create a new chunk. It has been given the default values specified in the template while everything else is initialised to 0. 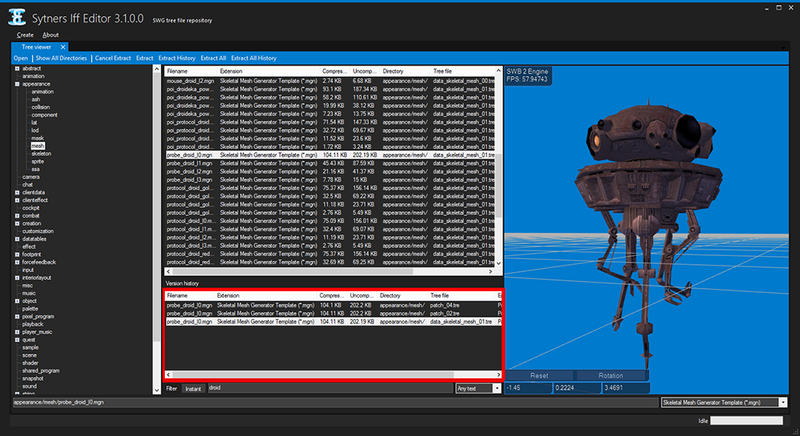 Here I use the value editor to change some of the defaults that were set, the hex source is updated automatically. If the template system looks scary then fear not - the community has already made over two hundred of them for you to use! The primitive types can be used to create structures and arrays. Arrays are defined like this Type[Name, ArraySize], where ArraySize is either a constant or a previously read scalar variable. If the meta comment is not provided, the program will attempt to find the appropriate value in the template file name. If this fails it will be inserted as CHNK. 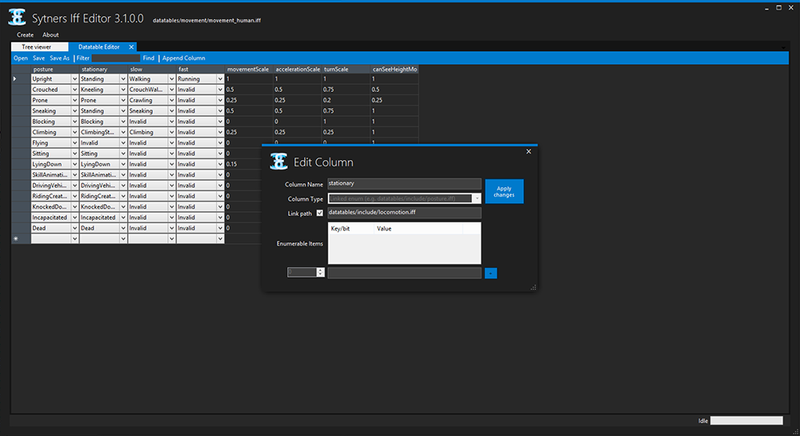 The datatable editor supports all valid datatables in the .tre files (there are a couple of invalid ones with duplicate columns and garbage data). 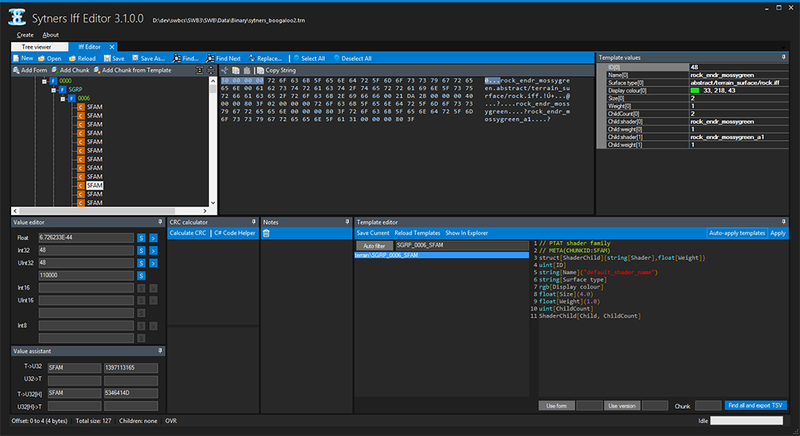 Unlike previously released editors for it has proper support for all types such bit vectors and linked enumerations. 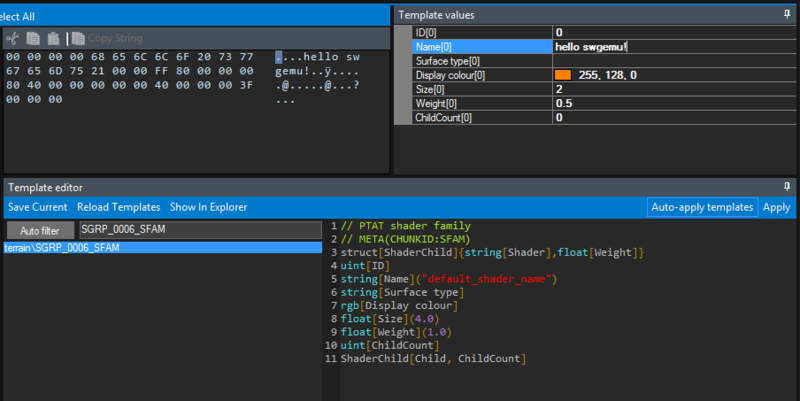 The palette editor allows the editing of the .pal files found in the client. These control colourisations of armour and so on. 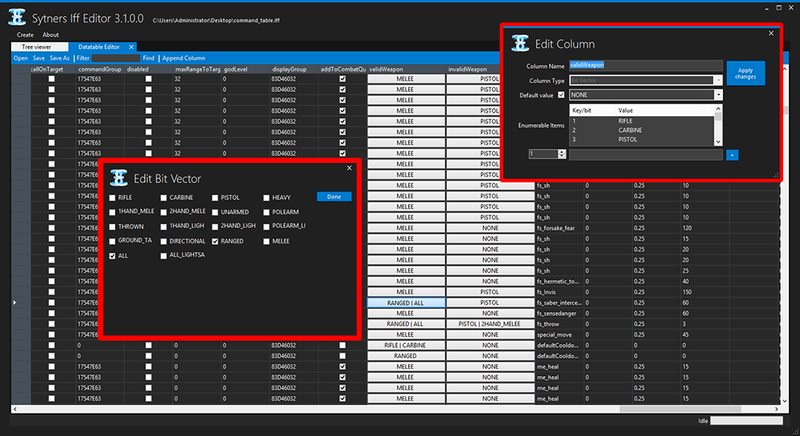 The editor has a number of features to make this straightforward such as being able to create gradients and edit multiple values at once. The program directly makes use of functions from my main world builder's library such as those used to extract and view tree files. This means certain parts of the tool will get free upgrades as I work on the world builder. For example I may add .tre writing support and move to the new renderer. A number of template packs have already been created listed below. If you make any templates, please post them in this thread and I will update the OP! Templates for the vast majority of files. No. It's just another tool just like tre explorer but organizes forms/records easier to read. And it allows for easier editting. Thank you Sytner. Looking forward to seeing more releases from you. Cleaning up my templates for terrain and I'll upload them. These are the templates I have done so far. This first release is going to be .trn templates to help people understand how the .trn files are setup. To install these just unzip them and put the terrain folder in the "template" folder of the iff tool. Any questions you can message me on #modthegalaxy in irc. Also here is a quick reference guide so you don't have to look at the templates. Minor new version uploaded with a couple of small features and templates for world snapshots. I've also adjusted the OP to have a section where I can link to the templates people post in this thread. If you post something I'll probably see it and just add it in but just drop me a PM if I miss it! Yup. Snapshot nodes and OTNL are both covered in the stock templates. Everything you need to edit them now. Any questions please refer to us in #modTheGalaxy chat in irc. More templates to come later. Main templates we can not do: Object .iff (Not feasible for iff editor. too may variables). Also .trn templates translate over to the .lay files. Feck it, might as well start adding my templates then, was originally gonna release them all with Jawa v2.0. It was mostly a joint effort by Syt and I last year, but are only being now converted into templates. They'll be optimized for 2.7.6+. Template - Mesh String Pack - appearance/ .APT/.SAT/.LOD/.LMG -- Most chunks aren't touched, only the ones to modify the important strings. You can download them separately here. Added a new version with several fixes and basic syntax highlighting for templates. hes just finished up them all last I heard.